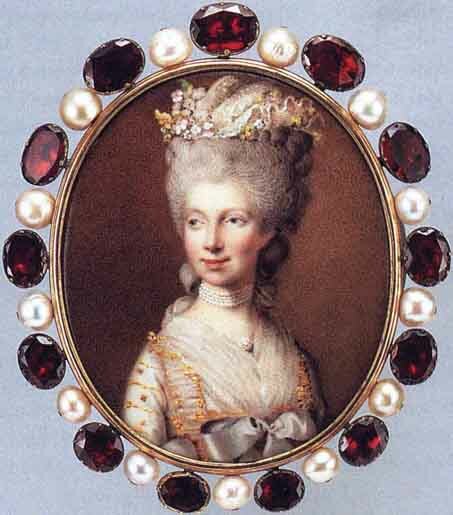 Heinrich Hurter's 1781 miniature of Queen Charlotte, wife of George III of England, framed with pearls and rubies. Formerly a princess of Mecklenburg-Strelitz, she has been proposed as the namesake of the classic desserts known as Charlottes. The miniature is held by The Rosalinde and Arthur Gilbert Collection in London, England. My husband and I were gratified recently when a friend recently told us he looks forward to our dinner and drinks invitations because we always have an unexpected guest list. This set us to beaming, obviously—our gatherings may not be perfect but we do try to make them congenial as well as spirited. Our village is so small that everyone knows one another, so planning a gathering enlivened with a few surprise elements is more difficult than one might imagine—blending old friends, new friends, couples, the unattached, conservatives, liberals, professionals, and free spirits into an amusing whole. The space issue can be another serious challenge: our dining table only seats eight people comfortably, yet we want each meal to be memorable. A stellar dessert always helps. Recently I have become enamored of Charlottes, an age-old dessert basically composed of fruit purée encased behind a decorative fortress of liquor-soaked lady fingers. Its history is as complicated as its preparation is simple. No book agrees on the origins of the Charlotte though it seems clear that the baked fruit desserts of the Elizabethan age rank early in its genealogy and that the trifle is a close cousin. Given the Charlotte’s popularity in the late 18th century, some sources believe that the wife of George III of England is the dessert’s namesake, perhaps due to her love of apples (apple Charlotte is a culinary classic) or as a tribute paid by Marie-Antoine Carême, superstar chef to an enviable array of crowned heads. Another scholar believes the name can be traced to one Goethe’s fictional characters, a certain Charlotte Buff, heroine of a bestselling 1774 novel called The Sorrows of Werther. 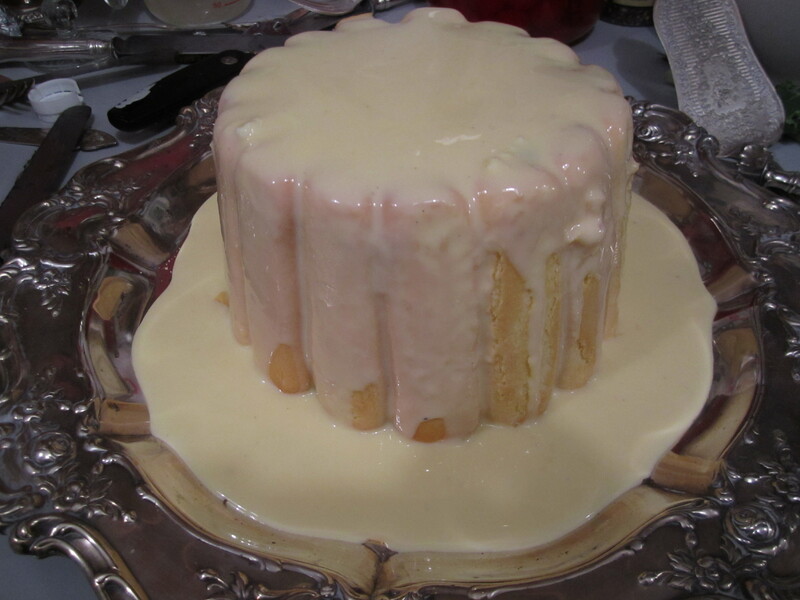 Complicating matters is the assertion of Richard Olney, in The French Menu Cookbook, that Charlotte correctly refers to the straight-sided metal mold used to prepare such a dessert—and only, by association, to the dessert itself. Then there’s the thorny issue of capitalization; does one or does one not? I like the formality of the capped C and am sticking to it. Charlottes have been a frequent dessert in our house of late, washed with crème à la vanille and carried into the dining room on a fancy silver platter of no great age but splendid appearance. My first attempt was just before Christmas, inspired by a cookery book my husband and I often use: La Cuisine de France by Mapie de Toulouse-Lautrec (Orion, 1961). 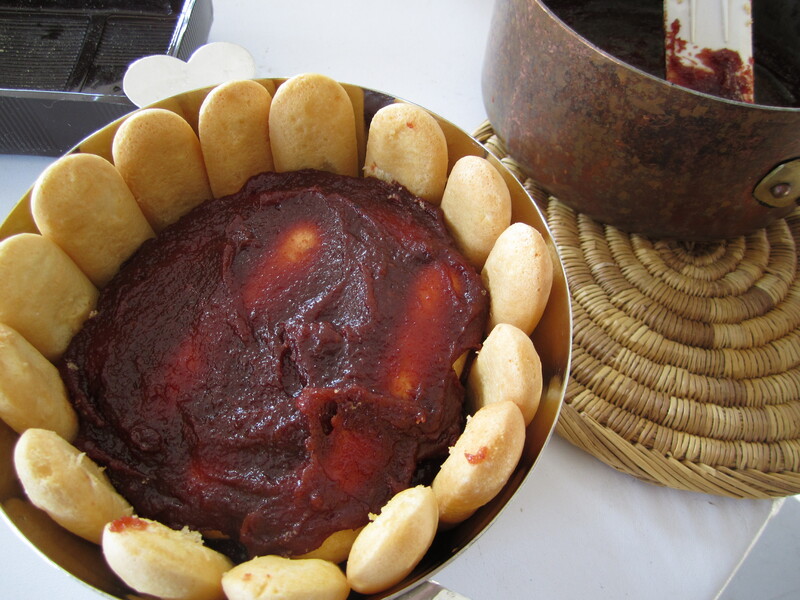 The creative countess offers several Charlotte recipes but one in particular caught my eye. Called Charlotte à la gélée au coing, it interweaves ladyfingers and quince jelly (coing is French for the little-used fruit), which certainly sounded wintery enough to me. Unfortunately I could not find quince jelly in time for a dinner party so resorted to melting down, in a sauce pan, a few shimmering blocks of quince paste I picked up at Whole Foods on Columbus Circle in New York City. This decision, I hasten to add, was not an unalloyed success. The flavor of the paste was too strong and the texture, even when melted, somewhat dense, but our dinner guests finished the Charlotte and asked for seconds. In the end all that remained was a few crumbs and a puddle of leftover crème à la vanille. Since that evening I have relied on Mme de Toulouse-Lautrec’s recipe as the foundation for other, quite toothsome Charlottes, including one made with apricot jam and another with raspberry preserves, each of which has been resounding successes. I plan on making an orange marmalade version in the very near future. The finished quince-jelly Charlotte, on its platter, covered in crème à la vanille, and ready to be carried into the dining room. SERVES: Mapie de Toulouse-Lautrec states that the recipe serves six (6), but we had eight (8) people at dinner and several had second helpings. NOTE: Makes about two cups. You could also double the recipe, as I did, so there will be enough crême à la vanille to put in a pitcher as extra garnish. 1. Scald the milk and sugar in a sauce pan, with the vanilla bean segments. 2. Beat the egg yolks with a wood spoon in a large bowl. 3. Remove the vanilla bean and pour the hot milk mixture, slowly, into the egg yolks, and stir until well combined. 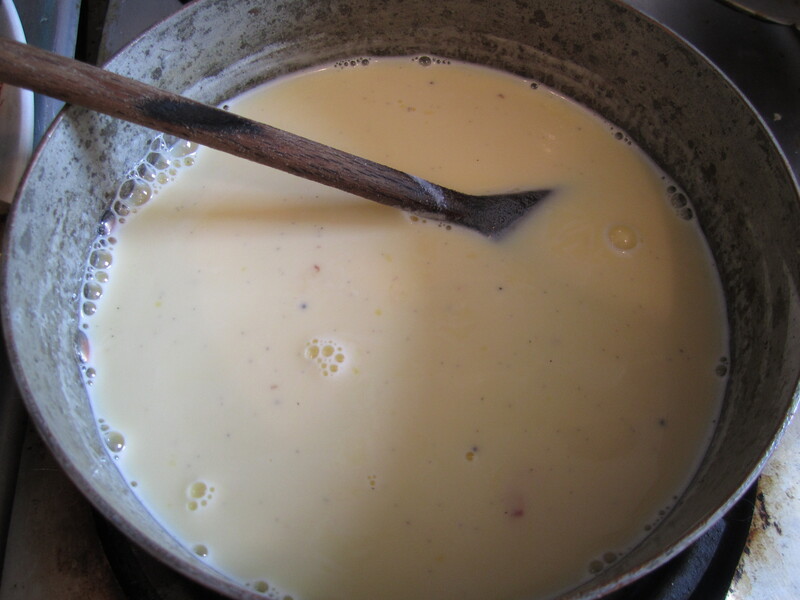 The vanilla cream, thickening over a low flame. 4. Pour the mixture back into the sauce pan and heat, over low flame, stirring constantly, until the mixture thickens, enough to coat the back of the wood spoon. Do not allow to boil. 5. Set the vanilla cream aside to cool and then refrigerate until cold and until ready to use. 2. Spread the bottom layer of lady fingers with jelly and continue alternating layers of jelly and moistened lady fingers until the mold is full. Finish with a layer of lady fingers. 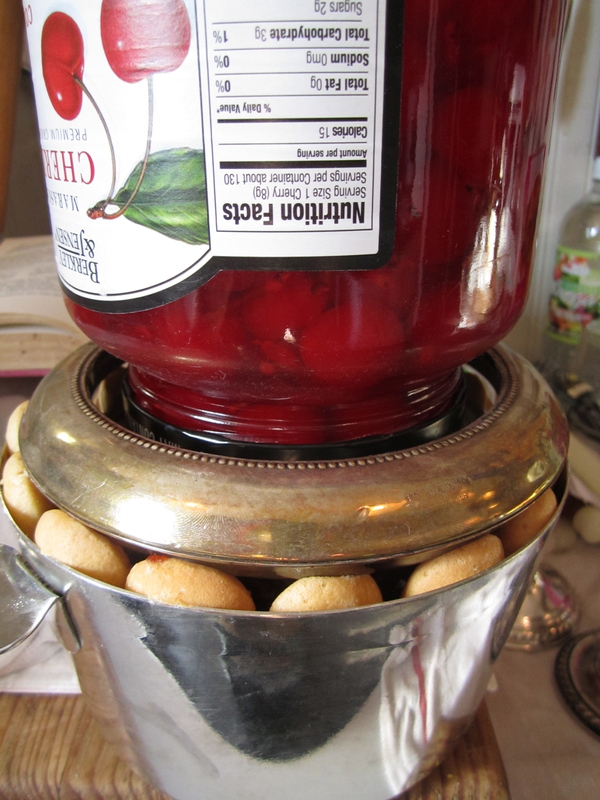 The Charlotte, weighted with a jar of maraschino cherries and a wine coaster. 4. Chill the weighted mold for several hours in the refrigerator. 5. Gently unmold the cake onto a dessert platter—you might have to slide a knife carefully around the edges to loosen—cover with the custard cream, and serve. 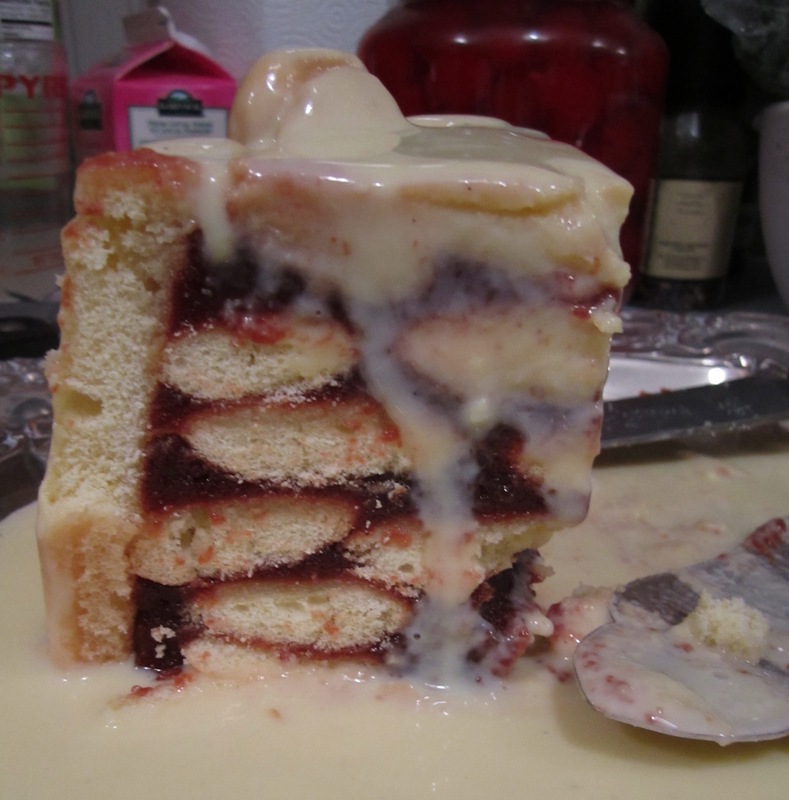 A cross-section of Charlotte à la gélée au coing, drenched with crème à la vanille. This entry was posted in Uncategorized and tagged Charlottes, Desserts, French Cuisine, Mapie de Toulouse-Lautrec. I love your descriptions and choices. We live in St. Louis, MO. and distance would not keep us from being new friends and free spirits at one of your dinner parties! Thanks very much for saying that! You might just get an invitation … we keep going farther and farther afield to new folks to spice the invitation list! Believe it or not, île flottant was the very first dessert I ever made for a dinner party; I was 26 years old and blistered one hand drizzling molten caramel over those creamy peaks. (Read the recipe, I thought, how hard could this be?) But my boss, who came to dinner, was impressed and said he hadn’t had île flottant for decades. Charlottes are incredibly simple and lots of fun to put together. I had my daughter help with the last one. Have you made Le Marly from the second volume of Mastering the Art of French Cooking? The first time I made it, the brioche was literally my first attempt at a yeast bread and was hardly impressive, but once soaked in kirsch, no one cared. Everything is better soaked in kirsch. The English versions are usually butter-soaked bread lining a special charlotte tin with gently sloping sides, made of quite thin metal to facilitate the browning of the bread exterior when it is turned out. Apple is the classic filling. Jane Grigson in her Book of Fruit says that these recipes are far older than 1760, but were possibly given Queen Charlotte’s name as a tribute.